The Salzach River is the lifeline of Salzburg: The major roads run along this river as well as cycling paths and promenades with chestnut trees. During the summer, the river banks are popular meeting spots for the young people of Salzburg. 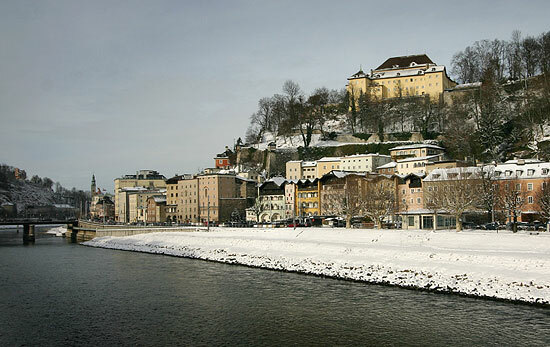 During winter, the river banks are covered in snow and less inviting. They are still important for adding a dash of open space to the city. A walk along the Salzach River Promenade can be soothening - walking enthusiasts can go as far as Hallein and beyond towards south. Or they walk northwords, where they will get to the Silent Night Chapel in Oberndorf. Keep in mind that the Salzach was an important trade route for salt between these two spots: In Hallein, the salt was mined and pressed into large bricks; in Oberndorf, they left Salzburg's territory.